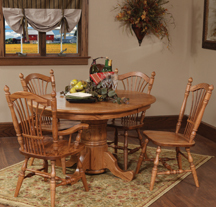 Rose Valley Furniture is not about roses, nor valleys – but it is most definitely about furniture. The kind of quality furniture that you expect to pay a fair price for and that lasts a lifetime. 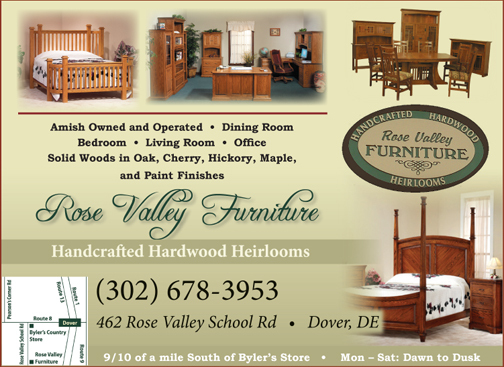 Rose Valley Furniture offers exactly what it looks like – handcrafted hardwood heirlooms, not veneered-over sawdust wood that falls apart if you bump it. A few facts: We initially placed our first orders in the early Fall of 2001 and were open by that Thanksgiving. By the way, this furniture comes out of Holmes County, Ohio – so, regretfully, I can’t legally put my own initials on these pieces as much as I’d be proud to do so. It takes about six to ten weeks for your order to come through. But, remember it is caringly crafted to last for years and it is well worth the wait. Sadly, I have to agree our showroom is not huge, but you’ll see it is packed with a spicing of style and selection so you can readily see the quality of the items we offer. Maybe, if I could just get more exposure with the “stuff” that we have, or can get, then I would probably be as busy as I look to be. Maybe, if it were possible for me to own a building as big as Wal-Mart, or half as big, or one-quarter as big then I could better display all the offerings. But, then, of course I would need a bigger parking lot, and that would mean it would periodically need to be swept of debris, not to mention snow cleaning – some winters anyway. By now you’ve probably guessed, I’m the owner of Rose Valley Furniture. And by now you can see that I’m neither a writer nor a comedian, but rather a homeowner-business man trying to outwit this sluggish economy. We were doing just fine – each year we were getting better and better at what we do and with more satisfied people until this thing hit us – this thing we call “the economy.” If people would just ignore that and not worry so, I think things would get better. I wish to goodness somebody would call the President and tell him to put that on the news. P.S. If you haven’t seen our “stuff”… well then, give yourself a treat. P.P.S. Don’t all come at once.